Wilmette, IL – July 7, 2016 — The highly anticipated source for race tracks is on shelves in July. 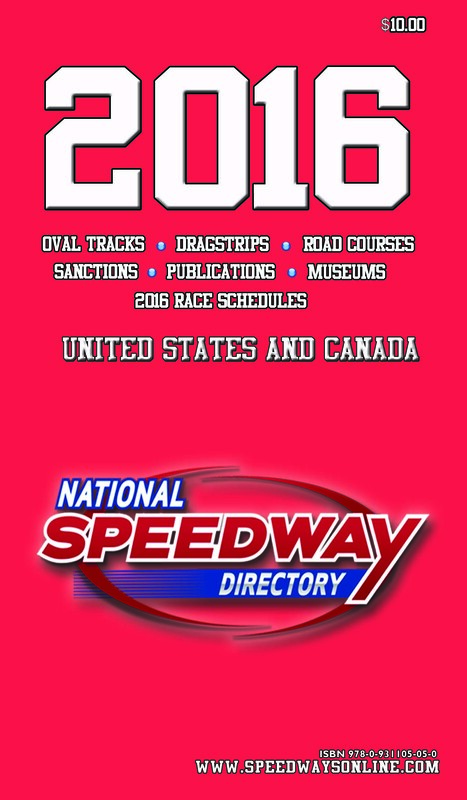 The 2016 National Speedway Directory lists a total of over 1,300 auto racing facilities. It is the most comprehensive publication of active tracks in the United States and Canada availa ble anywhere. This book lists detailed information on oval tracks, dragstrips and road courses. The phone numbers, addresses, exact directions, nights of operation and type of racing are included in this handy 592-page paper-back book. Listings for approximately 300 sanctions, 60 racing publications, and 70 racing related museums, pushes the total to over 1,730 motorsports related listings. The 2016 schedules for over 200 racing series with 4,000 events are also included. The price for one copy is $15.00 (includes postage) or two copies for $25.00. Orders can be placed online at www.speedwaysonline.com or emailing orders@speedwaysonline.com . 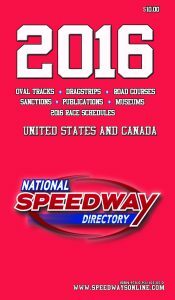 Checks or money orders can be sent to: National Speedway Directory – 909 Seneca Road – Wilmette, IL – 60091.